Even if you find you need to avoid dairy, most likely you can still enjoy ghee. Ghee is butter that has had all the water and milk solids removed. 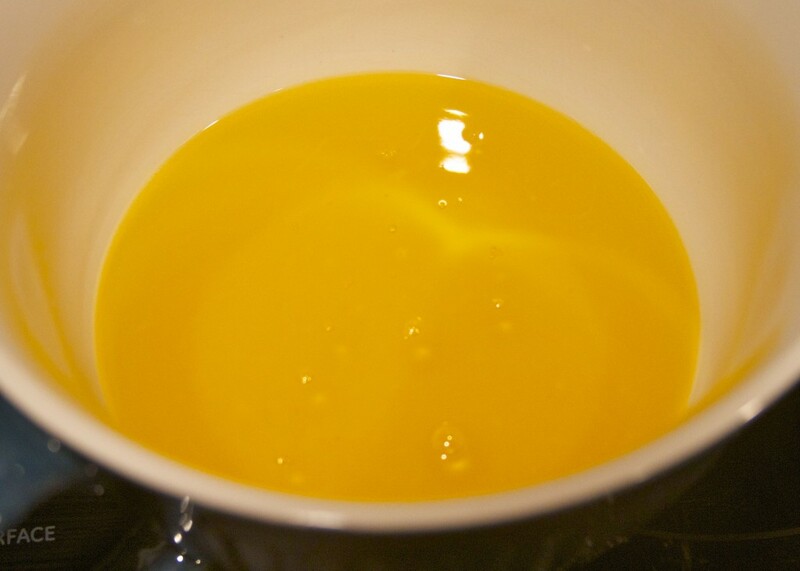 It is somewhat different from clarified butter in that the process of making ghee involves toasting the milk solids resulting in a nutty, rich flavor. Unlike butter, ghee has a long shelf life and can be used for high temperature cooking. It is also not as difficult to make as you might think. 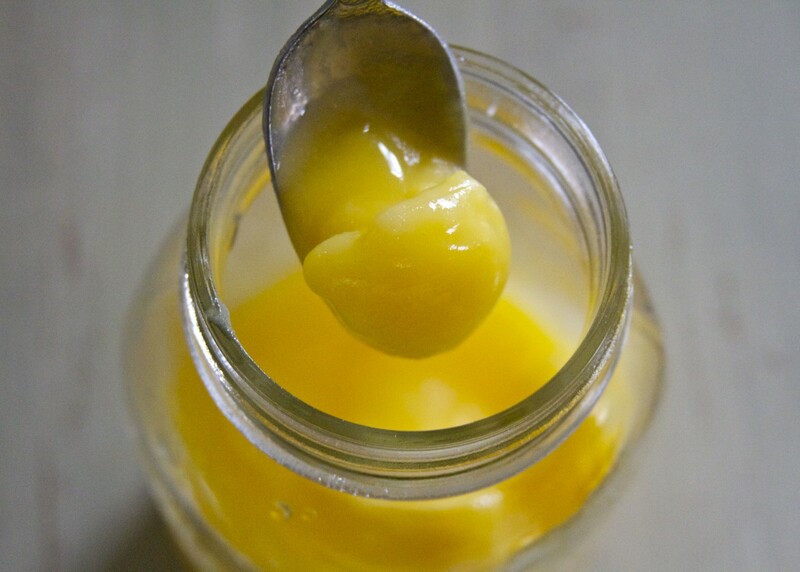 A tablespoon of ghee contains 8g Saturated fatty acid (SFA), 3.7g Mono-unsaturated fatty acid (MFA) and 0.5g Poly-unsaturated fatty acid (PUFA). Saturated fat, contrary to what you might have learned, is not an evil menace directly responsible for heart disease. (See this post and this abstract from “The American Journal of Clinical Nutrition”). Mono-unsaturated fats (also known as oleic acid) are the main structural fats of the body and are non-toxic even at high doses. Ghee is also rich in fat soluble vitamins like A, D, and K2, as well as CLA (conjugated linoleic acid). CLA is an essential fatty acid found almost exclusively in grass-fed animals and may protect against cancer, heart disease, and type II diabetes. To get the benefit of CLA from butter and ghee, I strongly recommend you purchase varieties from pastured (grass-fed) animals. 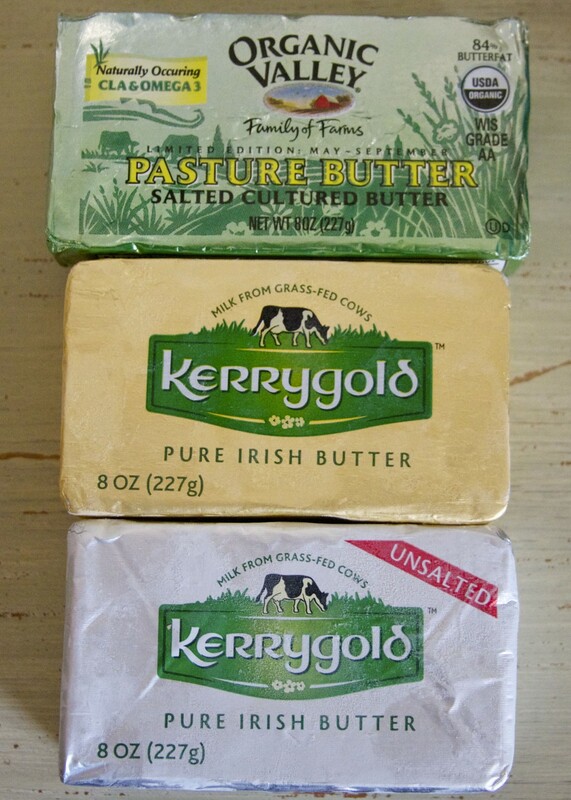 Using organic butter will also ensure you are avoiding hormones and pesticides that may find their way into your ghee. 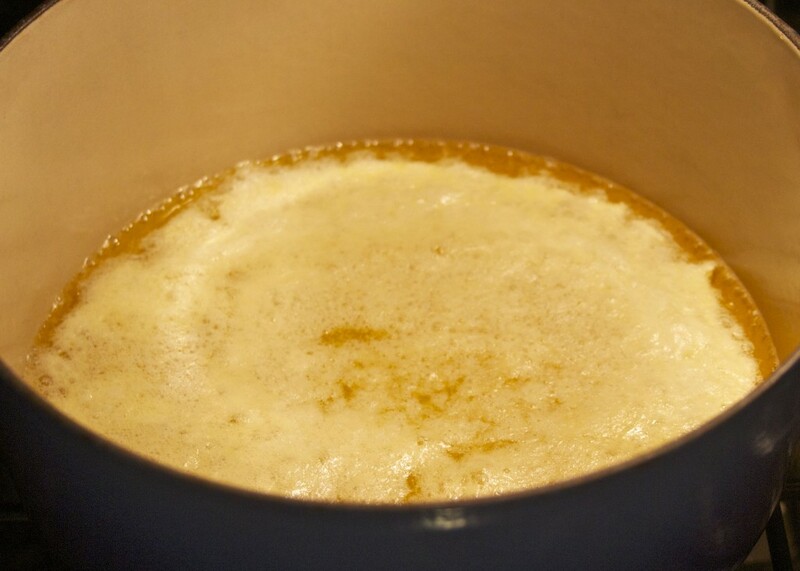 The traditional way to make ghee is on the stove top. But by making ghee in the oven you will avoid standing in front of the stove for long periods of time. It is important to make sure the milk solids toast enough to imbue the ghee with a nutty taste but if you let it go too far you can burn the solids and ruin the entire batch. 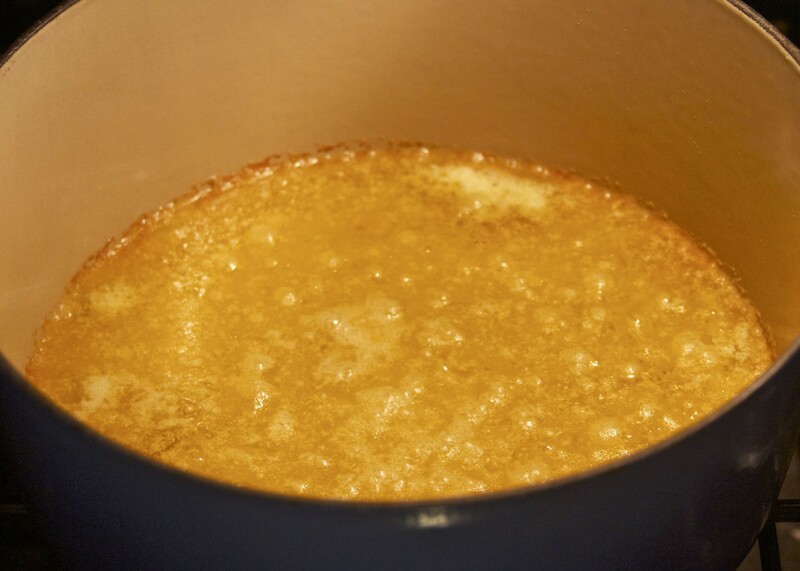 The following process is fairly simple and will result in a nicely toasted ghee taste without the need for constant observation. These instructions are for making about 1 1/2 cups of ghee. Times will vary with different quantities. 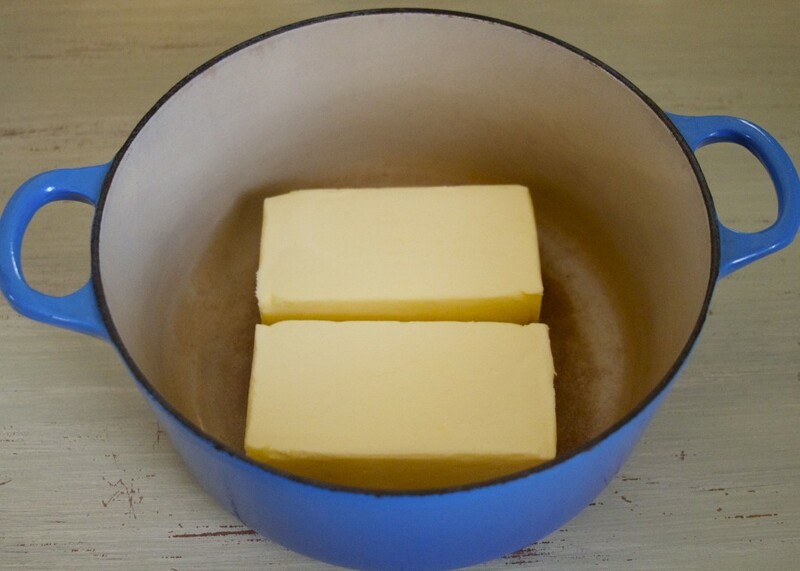 Place one pound of pasture butter in a Dutch oven or other oven-safe pan. Place pan into oven and cook, uncovered, at 250 degrees F. (No need to preheat) When you check on it after 45 minutes this is what it should look like. The milk solids are rising to the top. Continue cooking for another 30 minutes. At this point the water is boiling off and the milk solids are beginning to settle to the bottom of the pan and are browning. Remove the pan from the oven (about 1 hour 15 minutes total time) and allow to cool slightly. Strain through three layers of cheesecloth or even an old t-shirt or thin kitchen towel. Your empty pan may look something like this with milk solids on the bottom and some browned bits. You will be left with the pure butter oil – no water or milk solids like lactose and casein. 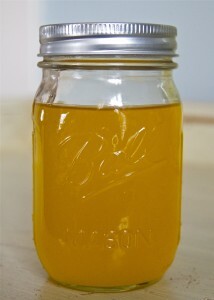 Pour the ghee into a glass jar that can accommodate at least 12 ounces. Store the ghee in the glass container at room temperature for up to six months or in the refrigerator for up to one year. Use your ghee for searing meats, sautéing veggies, cooking eggs or adding to sweeter recipes like Spiced Apple Compote or Fried Sweet Plantains. 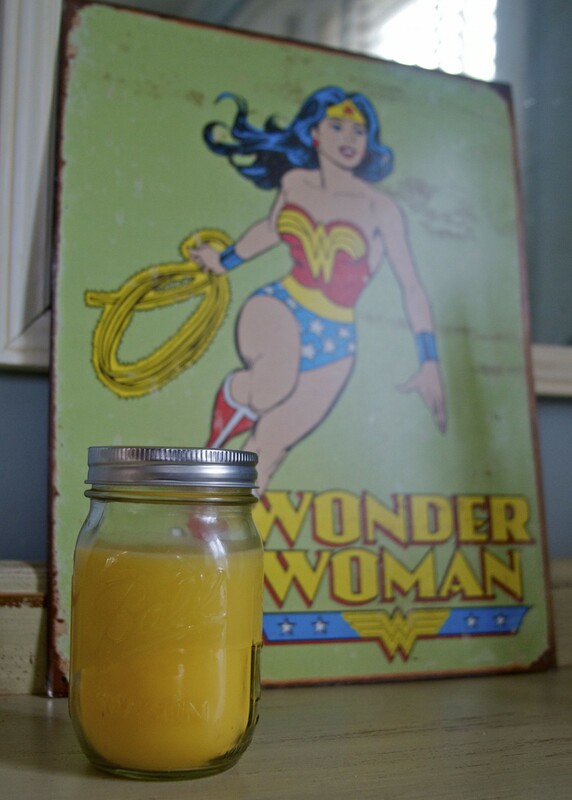 One of the benefits of making ghee yourself is that it is much less expensive than purchasing it. Making ghee in the oven will also create such an amazing aroma in your home you will begin to look forward to doing it. Best wishes for ghee making, eating and cooking! 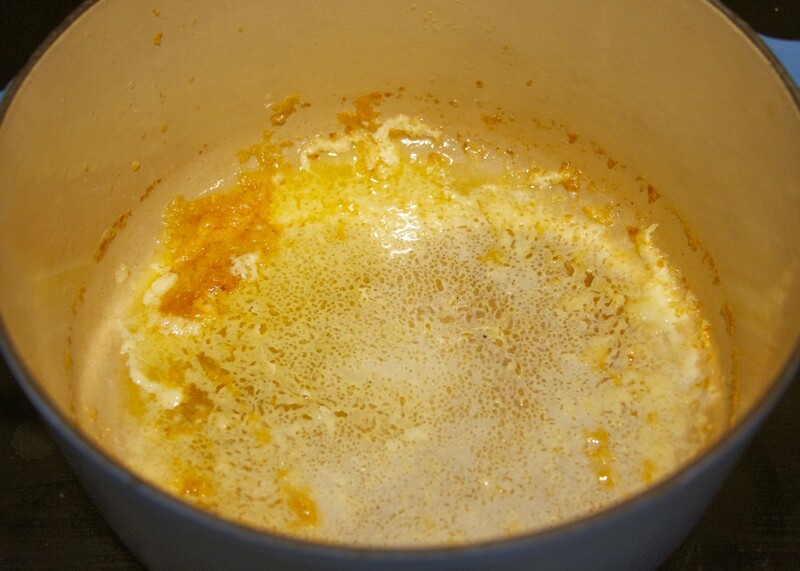 34 Responses to "How to Make Ghee in the Oven"
Oh my…I love this. 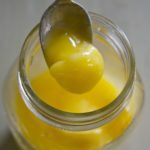 I’ve been wanting to make my own ghee as I’m getting close to running out…this seems like it will be much easier than the stove-top method! Thanks so much! Doing it this way takes some of the stress out of it for me and I hope it will for you too. I made stove top ghee and failed. Have just ghee following your instructions in the oven and have had success! Thank you. That’s great Margaret. So glad to hear it. You are very welcome. Thanks for the feedback. great !! 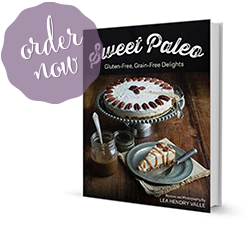 can you use ghee in baking paleo? Yes, definitely. I do it quite often! This was so easy, and came out perfect! Thank you! This is a fantastic idea! I advocate eating a paleo type diet to those looking for fat loss – especially to lose belly fat. Eating ghee is a much better way to take advantage of CLA than talking supplements. I love this suggestion! I usually have made ghee on the stovetop, but this will definitely cut down the attention necessary time and make it that much more accessible for constant use. Thank you! This might be a dumb question… but do you put the lid on the pan when you put it in the oven? It’s not a dumb question but no you don’t need to put the lid on the pan. Thank you 🙂 I am starting my paleo journey and am very excited to make this tomorrow! Does this mean you do not have to stir at all?? That’s correct. Stirring would just mixed the milk solids back in with the oil. Better to let it settle to the bottom while the water also cooks out. Thank you very much! I will try that. I wasted a pound of precious organic butter by burning it on top of stove. I much prefer this oven method to stovetop, but I will say that I tried this with Horizon organic butter last time since it was all that was available without running to many different stores. I had it in the oven for the 1.25 hours and really, it needed more time. I didn’t realize that until after the fact, but it had more water than the wonderful Kerry butter; I should have left it cook off. As it was, I ended up pouring off milky liquid after I had refrigerated my ghee and it solidified. It’s my understanding that it can spoil if not fully cooked??? Didn’t matter much here since I use up my ghee fairly quickly! Just a point to keep in mind I guess. 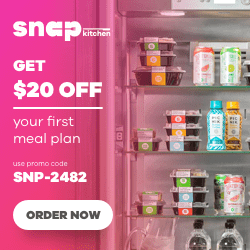 I love this recipe, so easy compared to the stove top method. My one problem is that both times I have ended up spilling a fair amount of ghee all over the counter. I need two hands to lift and pour out of my heavy dutch oven, and another hand to hold the handle of my strainer with the cheese cloth in it. I am just wondering if any one has any tips on how to set it up so I don’t spill any! You can try to ladle it out. Good luck. Thank you so much – I always dread when I run out of usli ghee because of the long process at the stove in making it and being sure I don’t burn the milk solids. This is great. The empty pot with the left over browned milk solid ‘fond’ is fantastic for making soup, OR you can deglaze it with stock or some wine and save it briefly in the fridge to use later in soup, sauces, or to toss steamed veggies in. No waste! Great idea, Rod. Thank you. New to this, so please humor me. You mentioned using the left over browned milk solid for other purposes, but isn’t the benefit of ghee that you are trying to get rid of the milk solids? I like the idea of not wasting anything. if you use the milk solids does this not contain the casein? that’s the whole reason that ghee is made, to avoid that. Really good question. Yes and no. Yes, the milk solids contain casein. So if you make ghee to avoid the casein then you would definitely not want to eat the milk solids. But, no, that’s not the whole reason to make ghee. Many people make ghee because they like the fact it is a fat that can be used at high temperature for searing meat and other things. When the milk solids and water are removed during the ghee-making process, you end up with just that butter oil that can be used for high temp cooking. There may also be a situation where one family member needs to be casein free but another does not. In that case you might have someone in the household who would eat the milk solids. I hope that helps. Thanks for your comment.